"My time working for Mr. Johnson at Ho-Jo's in Falmouth..."
"I met John and Edna when I was just starting the in the..."
"So sorry to read of this great loss of the family. The..."
FALMOUTH - John Johnson passed away peacefully at his home in Falmouth, Maine, on Jan. 29, 2019, with the music of Frank Sinatra and Ella Fitzgerald playing softly in the background. years, he worked at a variety of jobs in this field. His first was managing the Stouffers Restaurant in Manhattan followed by overseeing the Kingston, N.Y., School District lunch program where he ensured meals were both delicious and nutritious. Foreside Tavern) in Falmouth and moved to Maine permanently. Even after retirement, John continued to "work" for many years as an active member of SCORE. 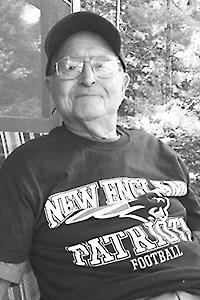 John was an exercise buff who loved jogging, bicycling, swimming, and golfing. Perhaps his biggest joy was connecting with people personally and professionally. His work ethic proved insatiable and his eagerness to lend a hand to his neighbors was renowned. As one of his longtime neighbors exclaimed, "John was such a vibrant legend on Brandy Pond". We hold his spirit and cherish his memory in our hearts as we remember how he would kiss the top of someone's hand and exclaim, "You're beautiful" or how he'd confide, "She's a real jewel". We can still hear his incredibly robust laugh. He was a wonderful and loyal best friend to many people and such a good sport. He remains forever our gem. John was predeceased by his wife, Edna and son, John. He is survived by daughters, Victoria Johnson and her spouse, Susan, and Nancy Feero and her partner, Penn; grandson, Joseph; sister, Eunice; nieces and nephews, Irene, Douglas, Bonnie, Cindy, Kris, and Michael; and eight grand nieces and nephews. The family is grateful to the Caretree Agency for the care provided to both Edna and John during the past eight years which allowed for them to live out their lives in the familiar surroundings of their home. We especially are thankful to Kim and Eliza who tended John during his final hours, and also to his wonderful friend, Maureen Cloutier. The family will host a celebration of John's life at Oceanview in Falmouth at a date to be determined in March.